This book was an impulse purchase on a long airport layover a few years ago. I’d heard good things about China Miéville and wanted to give him a shot, and I figured a quick kids’ book read would be a good place to start, and then — classic me — I let it sit on the shelf for nearly two years before getting to it. Un Lun Dun has a lot going for it. The protagonists, Zanna and Deeba, pre-teen girls and best friends, have been noticing weirder and weirder things around their school and housing estate in London, and before long, they unwittingly cross through portal to an alternate city, UnLondon, or as they hear it, Un Lun Dun. They soon learn that Zanna is the chosen one, prophesied by a sentient book, except the prophecies seem to be taken from overheard conversations so that they’re never quite right. The chosen one, for example, is known as the Shwazzy, a mishearing of the French choisis. Wordplay! 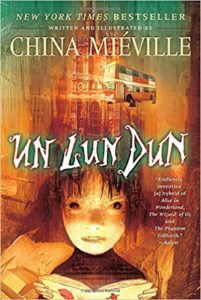 Miéville builds an elaborate, inventive, vivid alternate world in the city of UnLondon as the girls set off on their quest to save the “abcity”. He uses a lot of that amazing wordplay: the other “abcities” have names like Parisn’t, Lost Angeles, and my favorite, Sans Francisco; one of the characters is named Brokkenbroll, a double play on rock’n roll and broken umbrella; and there is a squadron of silent but deadly dustbin bodyguards called binjas. Miéville supplies his own illustrations, lovely and demented and perfect, like the bus with lizard legs on the front cover or those evil, demented giraffes, which the girls have to see to believe that they’re not as cute and doofy as everyone thinks. I can see why this book has drawn comparisons to Lewis Carroll and Neil Gaiman. It’s dark and twisted for a kids’ book, but that’s fine with me. It didn’t completely work for me, though. The dialogue never finds the right tone, swinging from stuffy and instructive to sounding more like what a child would write than what a child would actually say. The characters say “shut up”, a lot. Like, a lot. Soooo much. I finally tried hearing it in Vicky Pollard’s voice, and that helped a little. I remember going through my “shut up” phase in about the second grade, probably having heard it on TV, thinking I was very adult for using it in a story I wrote for a class assignment. My teacher did not agree. And then there’s the afterschool special aspect, coming mostly from the villain: Smog. Now, if he meant that as a play on Smaug from The Hobbit, then slow-clapping-bra-VO. Unfortunately, Smog is no dragon. It’s literally smog, and though the personified Smog is a terrific and horrifying and nearly unstoppable villain with armies of disturbing minions (including smombies! ), we also get a lot of lessons: how the real London defeated smog in the past, how smog forms and worsens, how smog affects people’s health, and even how public policy can make it better or worse. It all comes across as infotainment trying too hard to convey a Very Important Message. Miéville’s imagination is so full of weird and wacky insanity that it’s a real shame that adult me liked but didn’t love, but I think 12-year-old me would have loved it. The good news is that I have another of his books on my shelf, this one for adults, and I suspect it will be a better match for me. Share the post "The weirdest afterschool special I’ve never seen"
I haven’t read this one yet, but I loooooooove China. His real-world stuff is never my favorite, though. What’s the other book you have? I’ve been recommending Railsea as my gateway drug to Mieville, but his stuff is so out there it’s hard to know who will like him. I picked up Perdido Street Station last year, have a good feeling about it, just haven’t taken the plunge yet since it’s a bit lengthy. I’ve previewed about 20 pages or so, and it reminds me of Jeff Vandermeer, who has become one of my favorites. I’ll add Railsea to my wishlist, too, looks like one I’d enjoy. Thanks for the tip! My first introduction to China was The Scar, which takes place in the same world as Perdido Street Station. Good stuff. I’ll have to check out Jeff Vandermeer!